The three-day rafting trip down the Grand Canyon is a wonderfully unique experience that I am so happy I did! Our guides, Wiley, Jace, Jason and Joe, were fantastic - friendly, knowledgeable, funny, and overall great guys who made the experience that much more special. We met such wonderful people on our trip (but then again, I imagine all people who choose to do this type of trip would be wonderful)! 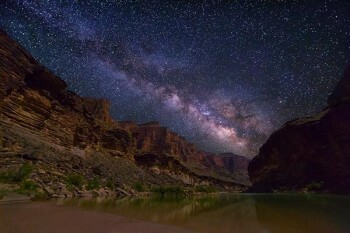 Highlights included sleeping under the stars, a great nighttime musical sing-a-along, exploring a cavernous waterfall, and experiencing the wonder of the Grand Canyon from such a unique vantage point. The only thing that would make this trip better would be to have one more day of rafting, as the first day is mostly getting oriented and the third day is all flat water and then leaving the canyon. The second day of rafting was fantastic, and I would have loved one more day like that!